Last year I took the first steps of trying to grow my own vegetable & herb garden. It’s been an amazing learning process: with many successes & failures! I find it utterly amazing, seeing how certain vegetables grow – I had no clue! It’s been an eye opening experience. Through it all, you realise how imperfect your vegetables grow, which lead then to so many questions on how we only see “perfect” vegetables in our stores, and what it takes to make them so “perfect”. 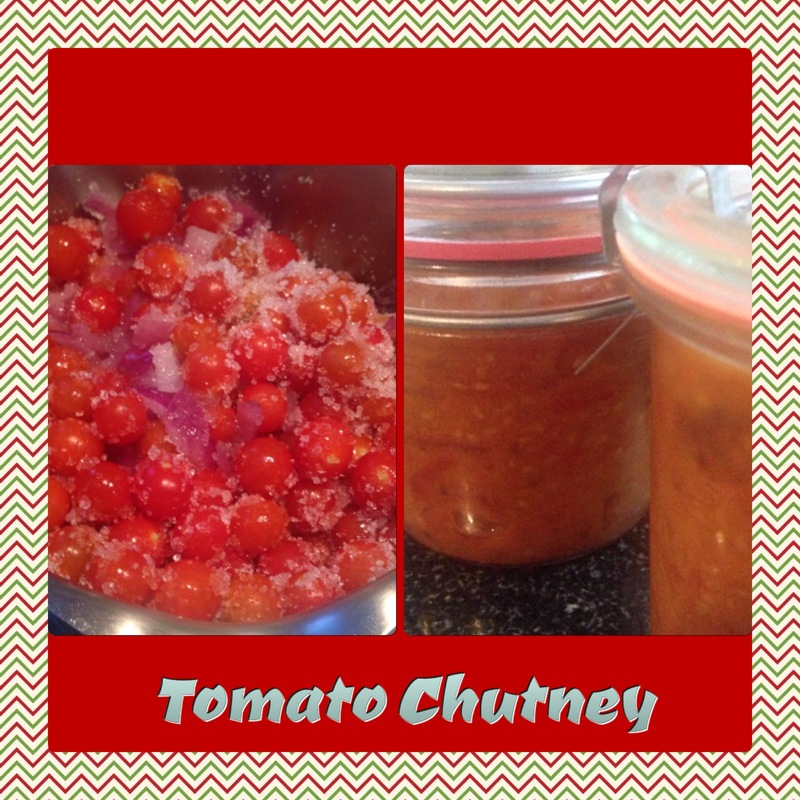 But putting that aside, I had a bumper crop of cherry tomatoes, and thus out of the need to preserve and not throw away, I made copious amounts of ‘tomato chutney’ for me, my family & friends. It’s delicious & sweet, which makes it a perfect accompaniment with cheese, or a topping on your fish, chicken etc. Use it in whatever you’d normally use ‘tomatoes’ and/or onions for! Just experiment! Note: I ran out of red wine vinegar, so added apple cider vinegar! So use other vinegars if you don’t have red wine vinegar…. Fry the onions in the coconut oil, until nicely softened and translucent. Now add all the other ingredients into the pot and stir. Get the mixture to a gentle simmer and allow it to cook slowly. My quantity took close to 90-120 minutes to cook down to a nice thick consistency similar to jam. Timing will be dependent on the quantity you cook. I suggest you check it ever now & then & stir, when it appears to be nearly complete, then keep stirring, since you don’t want the bottom to burn, due to the caramelisation of the mixture. Then decant into sterilised glass containers and seal. Keep in fridge. Once open consume within a 2 week period. If you want to make it more into a tomato sauce, simply puree it in a blender! And voila ‘tomato sauce’. Many people talk about ‘bullet coffee’ or ‘bullet-proof coffee’, and immediately when you mention there’s butter and/or coconut oil involved, there is an absolute look of disgust or nausea at the thought. The reality is far different. I find it actually quite tasty & extremely filling. And it’s my on-the-go version of a meal, when I just can’t be asked to eat, or just would rather have something to drink vs. food. It’s my main alternative to breakfast, if I know I’m having a late lunch out. 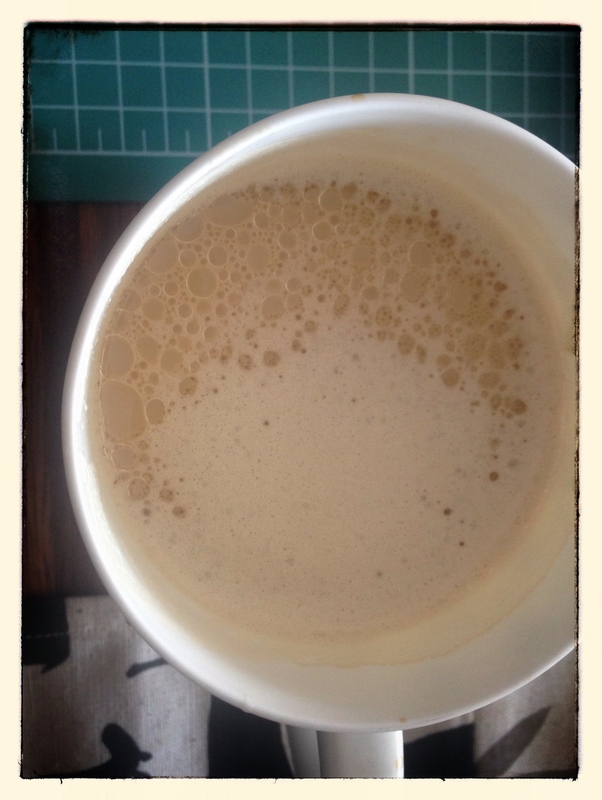 Hitting the spot – Bullet Coffee! and make sure you blend it with a hand mixer or blender (to “emulsify it”) otherwise if you stir, you will get fat droplets on top….which doesn’t bother me! My feedback to you is, add butter & oil, in whatever combination works for you! So open your mind & give it a try, you will find yourself pleasantly surprised! 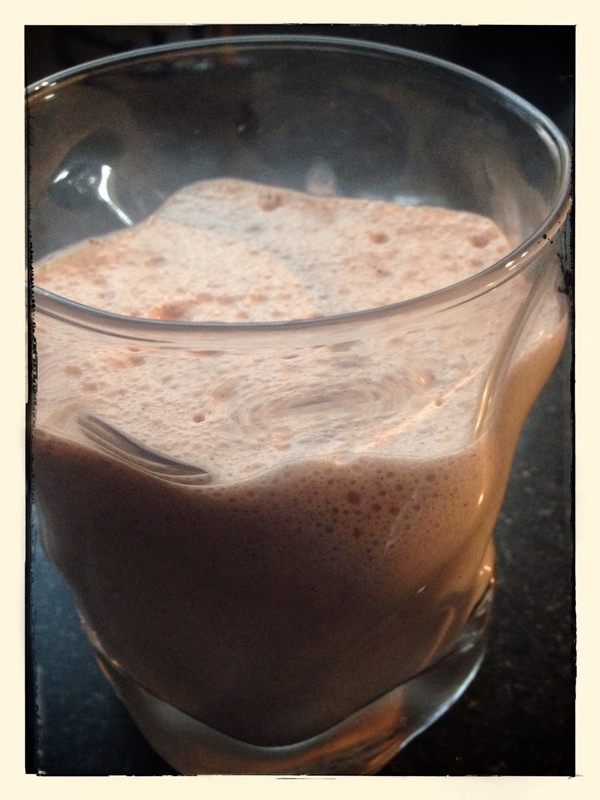 Stop those cravings with a Cocoa Fat Shake! Here’s my confession….my blogging has lapsed due to me lapsing from the LCHF lifestyle. I fell off the bandwagon, consuming again carbs & sugar the latter part of last year. And truly & openly, have reaped all the negative consequences in doing so! Not only picking up the weight I lost, but feeling sluggish, lethargic, bloated and the list can continue. And it is really, really hard to get started again. One realises again, how addicted one is to the refined, high carbs! 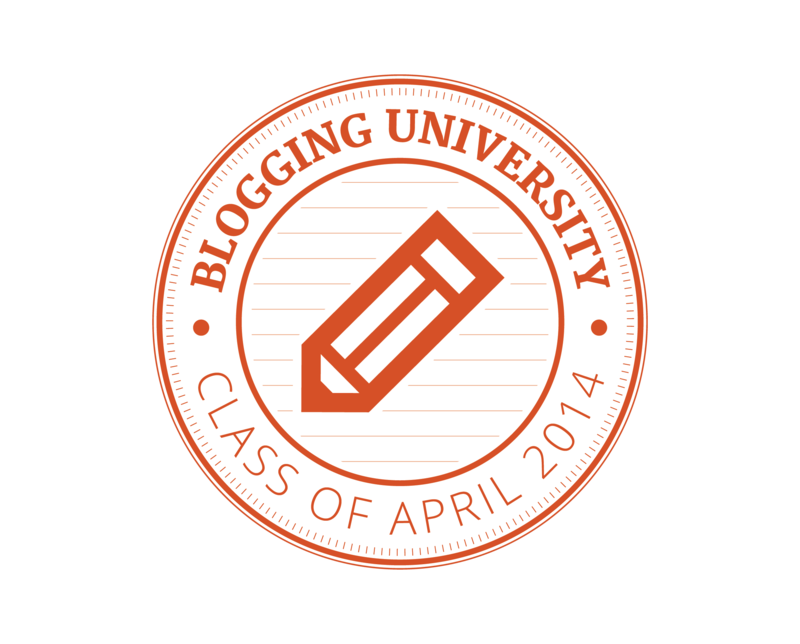 I came to the realisation, blogging for me, is my way of being honest with myself & sticking to the program. So this year has been a restart & re-ignition to the LCHF lifestyle. But the addiction cravings initially are painful, and one of my ways of overcoming them, is by satisfying my craving, by indulging in a GUILT-FREE Chocolate fat shake! So to those out there in the same situation, lift yourselves up, forgive yourselves & drink a shake! To be cliched “Keep Calm, Drink a Cocoa Fat Shake”!!! Hee, hee. Now only one point I need to make, is this drink is around 25g of carbs, esp. if using full cream milk and/or coconut cream and 80% chocolate. So, I’ve replaced the full cream milk with cream and/or coconut milk and the coconut cream with coconut milk. I make the replacement, since my body is too good at taking full cream milk and converting it to sugar i.e. I’m cautious with the quantity of dairy I consume! The point is, if you are really carb sensitive, and are trying to consumer =<25g carbs per day, like myself, then you need to half this drink OR use it for 2 portions, which is what I do. One drink for today, tomorrow or the next day, the second portion, which I store in the fridge. It’s great either as a replacement alternative to your breakfast or lunch or dinner, or as a “snack”! Cold version: Use a hand mixer/liquidiser to mix well and then consume! Hot version: Heat all the ingredients in a saucepan until it reaches a slow simmer. Stir continuously with a whisk OR use a hand mixer to mix well. Now ready to drink. Hope this helps with your cravings, as it does for me! 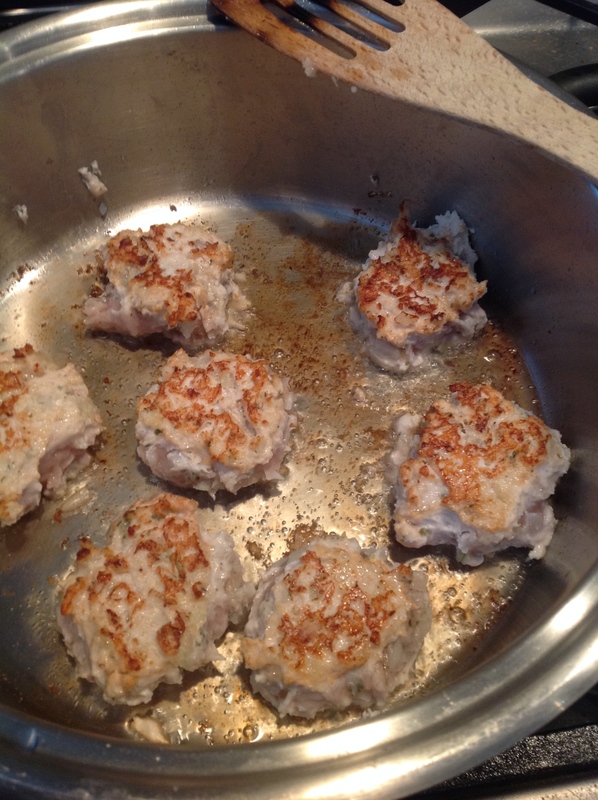 Heat the oil/fat in a frying pan, and brown the meatballs on both sides, until golden. Add the tomato paste and cook for a further 1 minute. 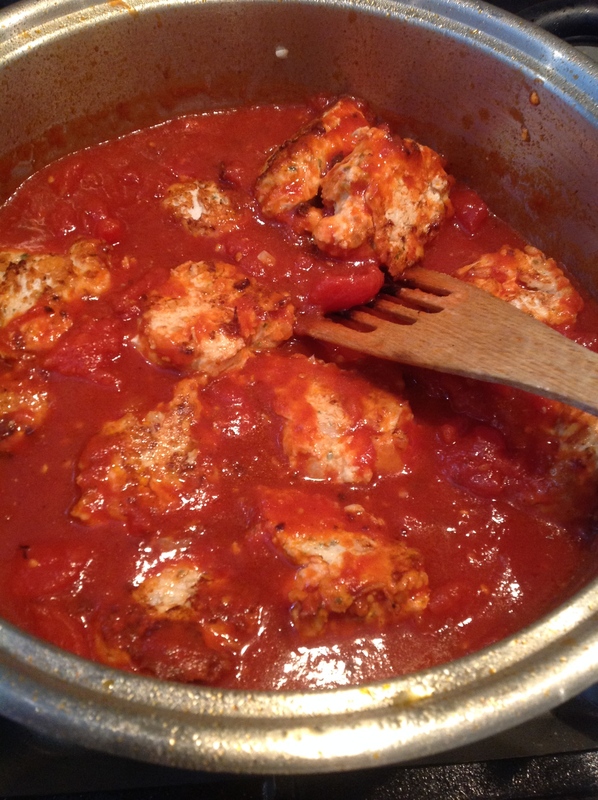 Pour in the tinned tomatoes, garlic, xylitol & dried herbs (fresh only at end of the cooking process) and simmer on a low heat for the next 20-30minutes. Add the cheese. Turn on the oven grill, and grill the cheese until golden & crispy. Now it’s ready to be eaten with zucchini noodles or your cauli-rice. 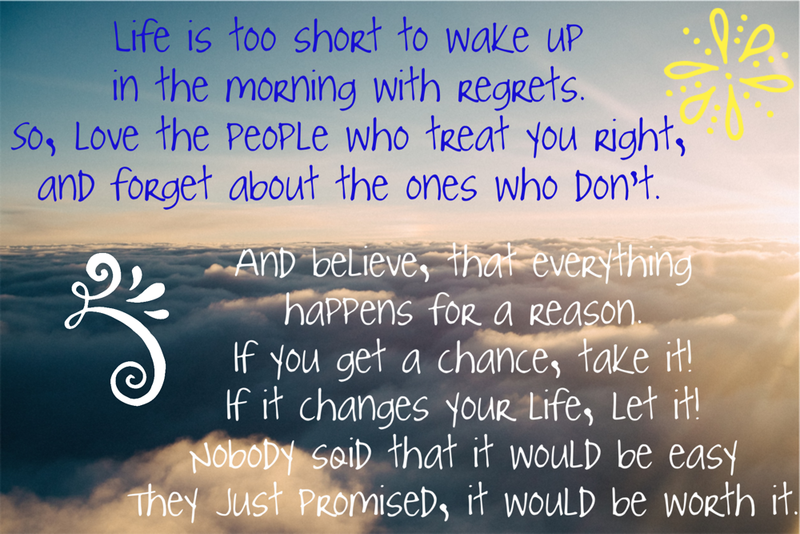 Life is too short to…. LCHF Believer. Perpetual Knowledge Seeker. Self-proclaimed Gourmet Chef & Foodie. Thank you for visiting my blog! (bo·da·cious) adj Mid 19th century (in sense ‘complete, thorough’): perhaps a variant of English dialect boldacious, blend of bold and audacious.